When it was built in 1878, Highfield Hall was originally surrounded by park-like gardens, carriage trails, and almost 700 acres of woodlands and was one of the earliest summer mansions to grace Cape Cod. One of the few remaining examples of Stick-Style Queen Anne architecture in the Northeast (a combination of Queen Anne architecture commonly characterized by steep roofs and ornate moldings combined with the Stick Style in which decorative wood trim, called stick work, was applied to the exterior to emphasize the basic wood frame structure underneath), Highfield Hall and its sister mansion, Tanglewood, are believed to have been designed by renowned Boston architects Robert Swain Peabody and John Goddard Stearns, Jr., whose many designs include Elm Court - built for the Vanderbilt family in the Berkshires - as well as the Custom House Tower in Boston. The landscape design for both estates was created by Ernest W. Bowditch who worked with Peabody & Stearns through the mid-1880s; Bowditch's other designs include the grounds of The Breakers, Marble House and Chateau-sur-Mer in Newport, Rhode Island. I won't give you the entire history of Highfield Hall as that can easily be read on their website but I will tell you that James Madison Beebe, patriarch of the family, acquired his wealth as the owner of J. M. Beebe & Company, one of the largest retail stores in Boston as well as one of the largest dry goods importing and jobbing houses in the country in the mid-1800s. As an interesting side note, Junius S. Morgan (father of the famed financier J.P. Morgan) was invited to become a junior partner in the firm in 1849 and two years later the name was changed to J.M. Beebe, Morgan, & Company. Possessing a love of the woodlands, when James and his wife Esther decided to purchase property in 1872 for a summer retreat, they chose 700 acres of woods in the center of Falmouth rather than hobnob in Newport with the rest of the rich and famous. 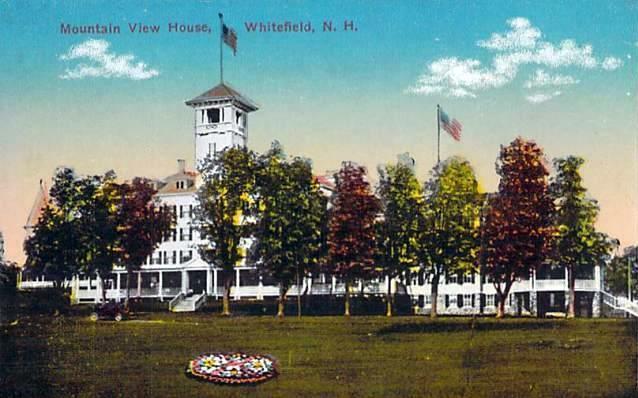 Following their father's death in 1875, the Beebe progeny used their inherited wealth to build one of the first expansive summer retreats on the Cape constructing two wooden mansions far enough away from each other on the property to ensure privacy but close enough to ensure lots of family time together . Brothers Pierson and Franklin Beebe, along with their sister Emily, lived at Highfield Hall which was completed in 1878 while their brother, J. Arthur Beebe along with his wife and children, lived at Tanglewood, a sister mansion that was completed in 1879. Following the death of the last Beebe child in 1932, the property went through a series of owners and Tanglewood sadly succumbed to the wrecking ball in 1977. When Highfield Hall was also threatened with demolition in 1994, the group Friends of Highfield sprung into action to save the remaining mansion eventually entering into a lease with the town of Falmouth as Historic Highfield, a 501 (c)(3) not-for-profit corporation. Visitors to Highfield Hall can learn more about the Beebe Family including their tragic trials and tribulations in the house's Museum Room exhibition The Highfield Story located to the left of the Great Hall. In this ornate room which was possibly used as a library during the family's time, there's also information on the history of Highfield Hall itself along with the story of its narrow escape from demolition and subsequent restoration before opening to the public as Highfield Hall & Gardens in 2013. Though I truly love a nice historic house, as I mentioned above, I was visiting Highfield Hall not so much for the history - which is always a draw for me - but because of two art exhibitions that I had been told about and driven over from Connecticut to see. As one of my frequent distracted sidekicks Paula is an art teacher, I brought her along for the trip as I was sure that she would enjoy the exhibitions which more or less start as soon as you drive onto the property as you start to notice what look to be some very large spiderwebs adorning some of the trees. Or are they ...? 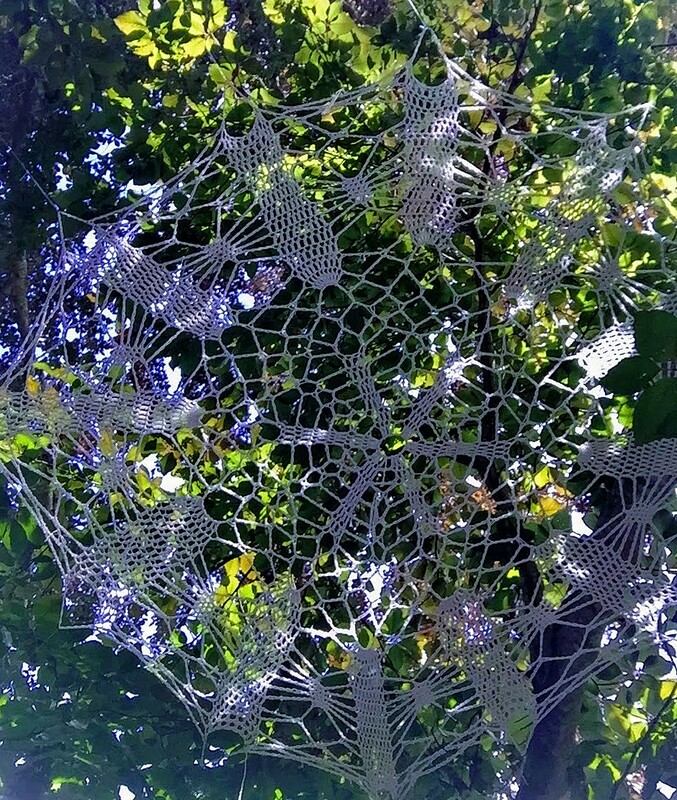 Closer inspection reveals that nope, these are definitely not spiderwebs woven by the biggest-I-don't-want-to-see-it-if-it-really-exists spider but instead are giant crocheted doilies which are the hallmark of Southern California based artist Ashley V. Blalock. 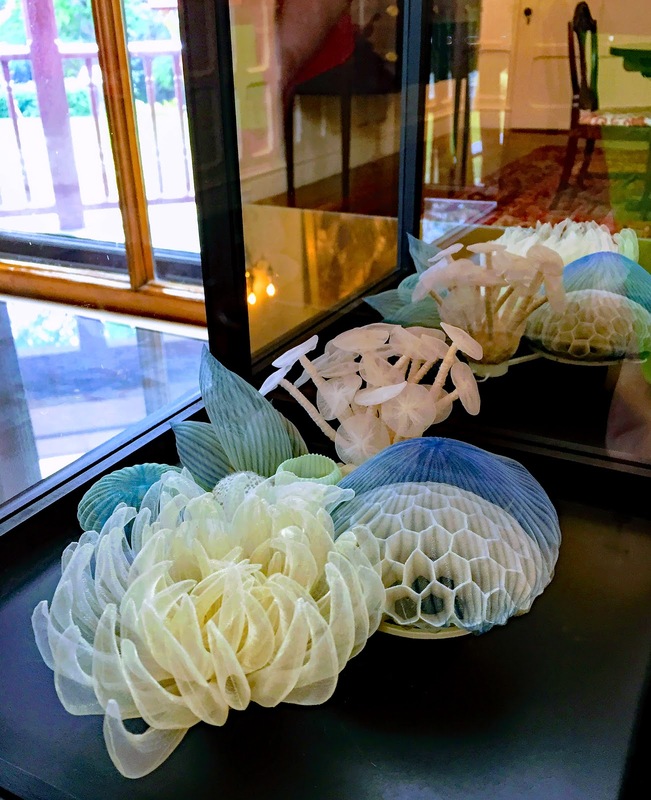 It's certainly a great way to introduce the exhibition Interwoven: Art Meets Nature which is on display from June 25th to September 6th. 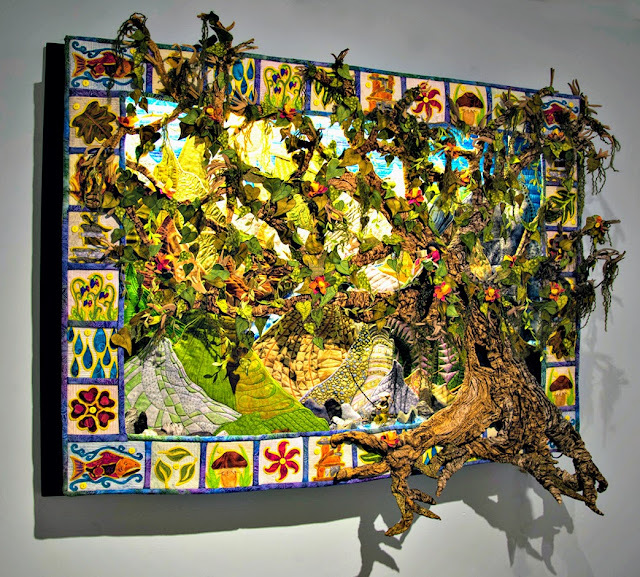 "This contemporary fiber exhibition is curated by Marcia Young, publisher of Fiber Art now, a fiber art periodical and community that explores the wide breath of fiber as an artistic medium. The show of virtuoso works by national artists includes nearly every form of fiber art, including weaving, felting, tapestry, needlework, basketry, handmade paper, silk painting, and book arts. Interwoven: Art Meets Nature will connect the natural world with the materials and techniques that are so familiar to all of us, in an engaging, nature-based show of contemporary fiber art and textiles." Just looking at the giant doilies artfully displayed on the trees, I knew that this wasn't going to be one of those "I know art is subjective but I honestly still just don't get it" sort of exhibitions that leave me wondering if I'm some sort of an art illiterate so I was quite looking forward to seeing more of what was on display in elsewhere in the house and on the property. I was caught up in their web of artistic intrigue you might say! After entering the mansion, one of the first things you notice in the Great Hall are more of Blalock's giant doilies but instead of white giant doilies, red ones adorn an area around the grand piano as well as flow up the Grand Staircase. When I first walked in and saw them I didn't think 'spiderweb' as much as I did 'cobweb' but certainly not the sort of cobwebs you'd find in an ordinary house! The more I looked at them though, the more they evoked remembrances of my grandmother's house and the doilies that were always beneath the lamps on end tables and such. I don't recall that they were ever red in color - my Old Gram B was pretty conservative - but the red definitely does pop against the white wainscoting off the alcove and the display just pulls you in. Across from the giant doilies, in the the Ballroom, another piece of art caught my eye and drew me over for a closer look. 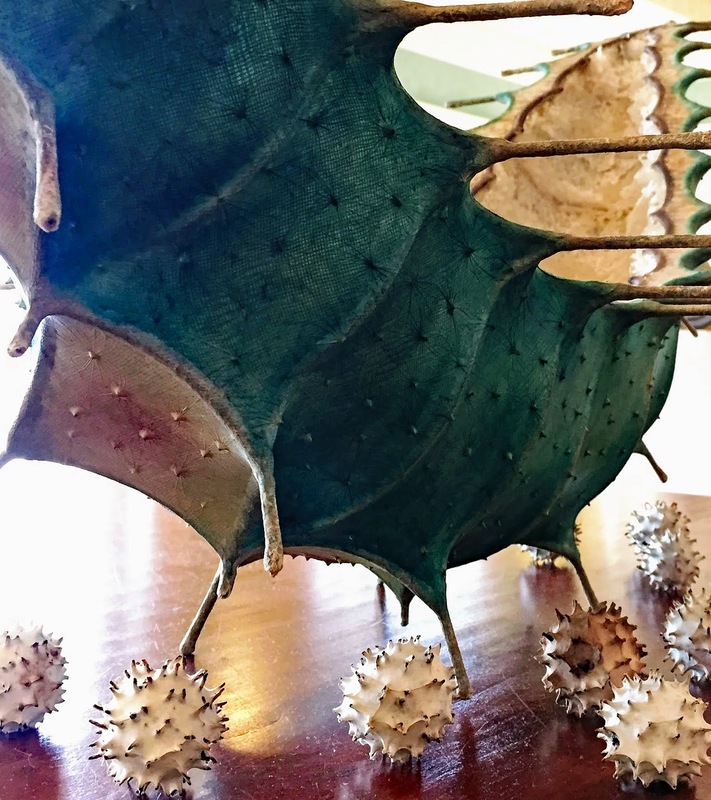 A Shell of a Former Life by Boston-born artist Joyce Utting Schutter made from flax, cotton, cheesecloth, steel, Prairie Dandelion and Sweetgum seedpods was nothing short of fascinating no matter what angle it was looked at from - and I looked at it from a lot of angles! The more amazing thing was that even though this sculpture looked like it could be part of a science fiction movie, it totally owned the table that it stood on as if it had been placed there back in the day when the Beebes were doing their lavish entertaining at Highfield Hall. Some of my other favorite pieces in the Ballroom are the hand-stitched banners Out of the Box I and Out of the Box II by Korean-born artist Youngmin Lee displayed over the north fireplace and on the wall next to it, Remembering the Wind made from digital fiber and mixed media by Wen Redmond. Across the room over the south fireplace, Anastasia Azure's Zenith definitely required a closer look. Inspired by mandalas,the sculpture uses contemporary materials - hand-dyed fishing line and brass wire - along with an ancient cloth-making technique called double-weave. To really appreciate it, you have to look at it from all angles but don't touch even though it's tempting! 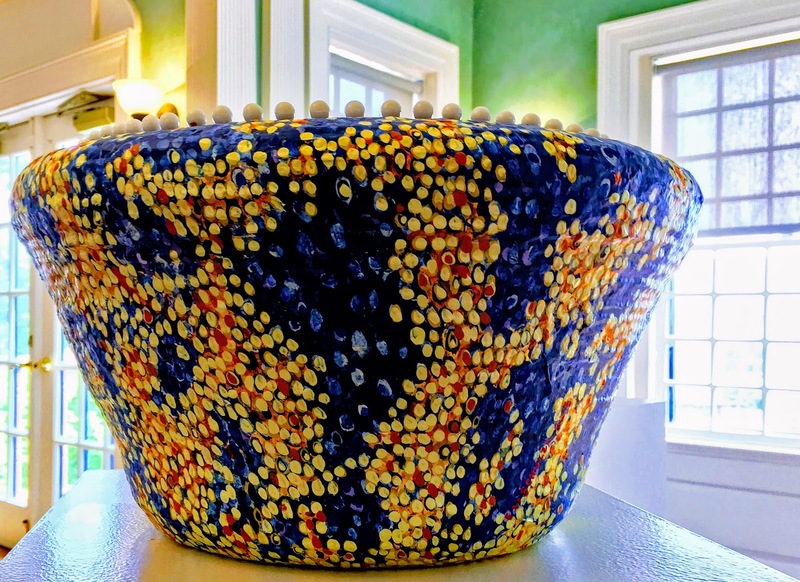 Nearby, Ripple is part of Jackie Deroyter's Vessel series of sculptures. 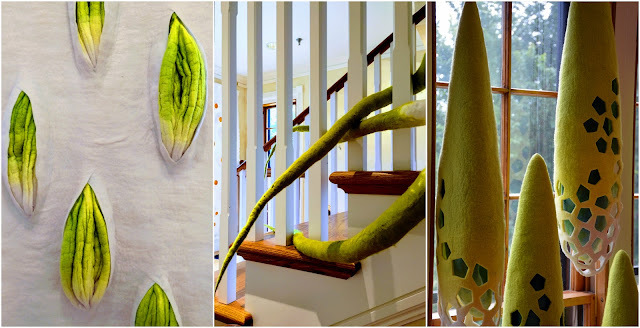 The artist, who makes her home on the Cape in the town of Brewster, has another fiber sculpture in the show that stands at the top of the staircase. The basket sculpture below by Elizabeth Whyte Schulze is made from mixed media including pine needles, raffia and sumi paper. Titled Griffen, you simply must be sure to peek inside! While I was peeking inside Griffen, other visitors to Highfield Hall were also captivated by A Shell of a Former Life! Moving into Highfield Hall's Dining Room where the Beebe family served up sumptuous feasts for family and friends, there are lots of wonderful pieces on display but I had two favorites. The first one is a diptych titled Chaco by Katherine Glover which is made from handmade Indian Khadi paper that has been torn into strips then painted with fluid acrylic. Attached to a birch panel, the piece has been embellished with gold leaf with gives it many different shades of color depending on where one stands to look at it. My other favorite piece is a very involved and technically challenging one by Japanese artist Mariko Kusumoto who, by heating translucent polyester fabric into the shapes that she desires, has created Seascape. As this is one of those sculptures that calls for your hand to just reach out and touch it, the artwork is displayed in a glass box with a mirrored back which is the perfect setting for it, not just because you can't make the mistake of touching it but because you can see it from another angle when you peer into the box. Makes it tricky to photograph but I think I did okay! 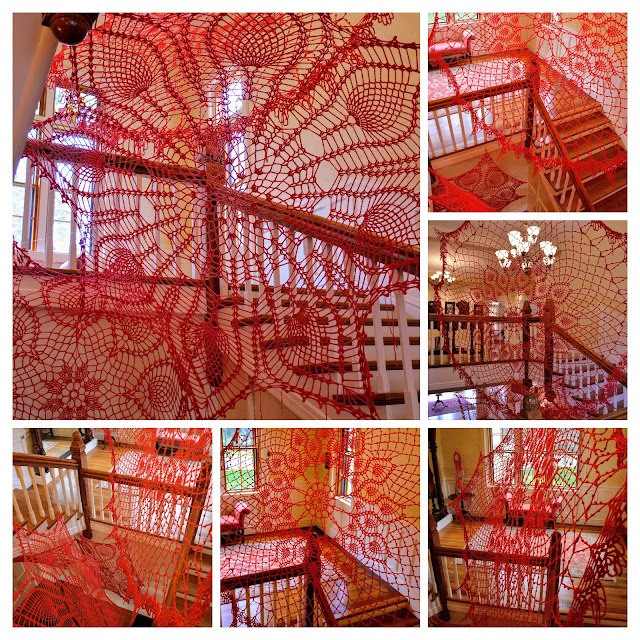 Moving upstairs past the beautiful red doilies of Ashley Blalock, there was more Interwoven to be seen along with a second exhibition that I'll get to in just a moment. 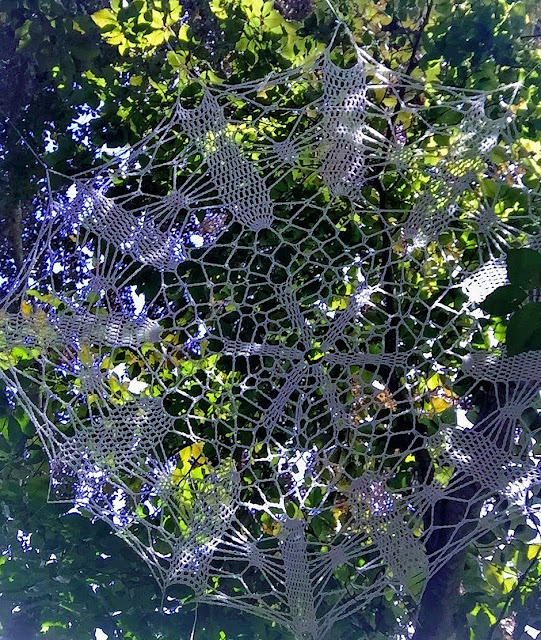 First though, aren't these doilies just amazing? 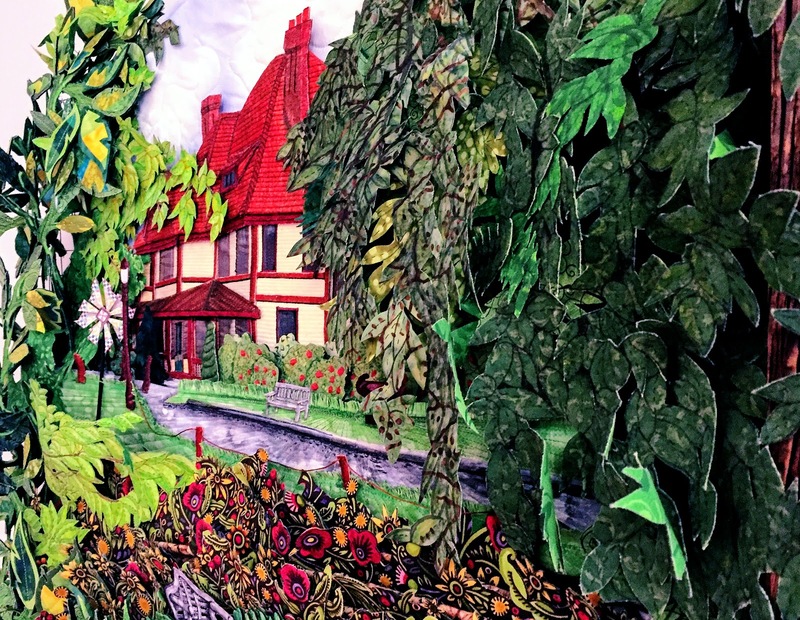 At the top of the Grand Staircase, the Clark Gallery (formerly the mansion's Music Room) is where works from Liz Alpert Fay's Tree Skirt Series can be found. Each artwork begins with inspiration derived from a specific piece of wood that the artist finds and then a textile "skirt" is added to give the sculpture clues to its meaning. 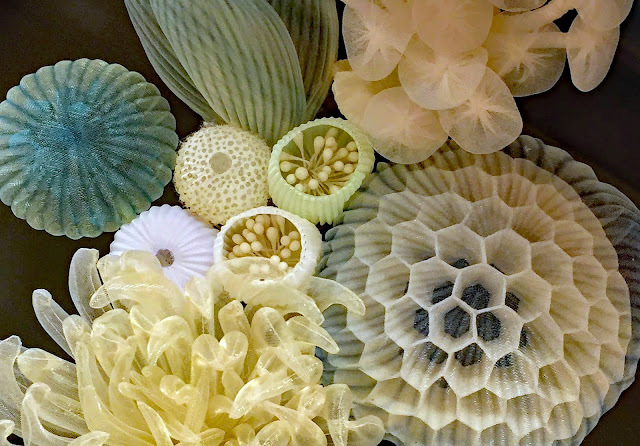 Fay uses a traditional rug-hooking technique to create the skirts that highlight her sculptures which celebrate the beauty of the natural world as seen in Tail Feathers and Moss and Lichen Series #1. Wrapping its way around the banister of the staircase that leads to the third floor where once upon a time, the staff of the Beebe Family lived and which now serves as administrative space, Searching by Swedish-born artist Kristina Goransson feels like it is doing just that. A Boston-based fiber artist, Goransson specializes in felted works. Though the piece is usually displayed on the floor, due to the limited display space in the house which is, after all, a house and not an art gallery, Annie Dean, Highfield's Director of Programs and Exhibitions, decided to display Searching on the staircase instead - a move that definitely works for as everyone knows, roots grow where they want to grow and not always where we'd like them to. The other way in which the arrangement really works is that if you follow Goransson's piece Seeds 2 that is displayed on the front of the staircase past Searching which runs along staircase, you'll end up at more of her felted sculptures displayed hanging in the windows at the end of the staircase making it seem as if the seeds were searching for the sun in order to grow. Pretty neat, huh? For those who'd like to learn more about the different techniques that were used by some of the artists featured in Interwoven, there are hands-on displays in the Conference Room which was formerly two bedrooms. Also on display in the Conference Room are some pieces from the second exhibition at Highfield Hall which runs through September 4th. 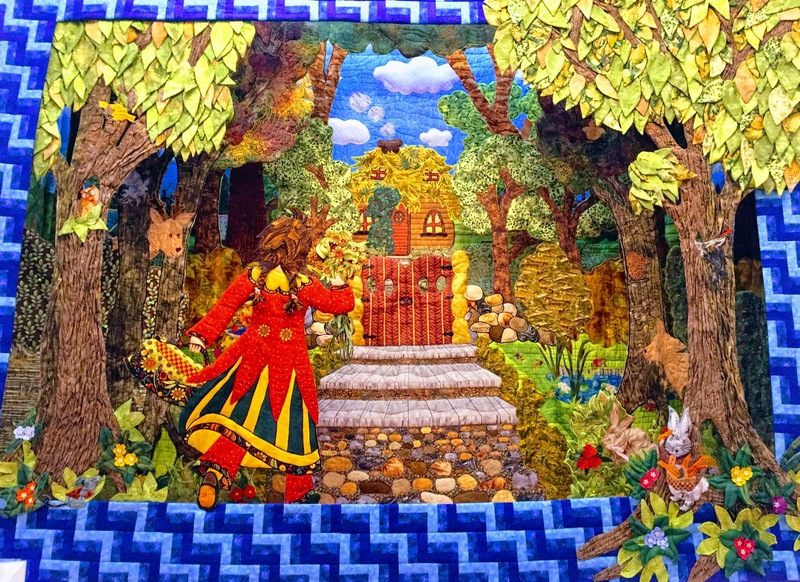 Once Upon a Quilt: 3-D Quilts is a solo show that complements Interwoven featuring works by Dominique Erhrmann, a Canadian artist who was a chocolate and special event cake maker for more than 25 years before teaching herself to quilt, to draw, and to create 3-D quilts in 2005. Why 3-D? "Because it's the way I imagined them," says Ehrmann on her website. Following are some of the quilts on display by the internationally-renowned fiber artist which are even more impressive in real life than they are on the page - and they're darned impressive on the page! Luminescent - the left side shows the piece unlit, the right side is the same piece with the light behind activated - what a difference, huh? Various views of Serenity including a close-up of Dominique quilting while sitting in a tree and her husband fishing. To Approach Highfield Hall is a beautiful 3-D quilt created by Dominique especially for the venue. Sized at 72x 96x18, this piece took two years - or over 1,000 hours - to complete. Ehrmann's larger-than-life pinwheel - Kinetic Quilt - can be found just off of the front porch. 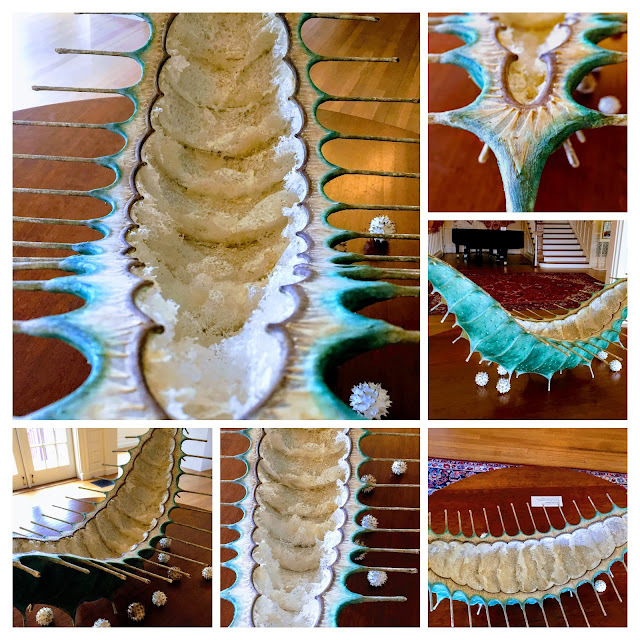 Needless to say, there are a lot of artists and works that I didn't include in this post as I would encourage you to take a drive out to Falmouth and visit Highfield Hall to see the rest of both exhibitions yourself. While you're there, be sure to take a walk around the outside of the property and visit the Sunken Garden, check out the restored historic Ice House, stroll through the West Garden, and marvel at the amazing trees along the Beech Tree Path. 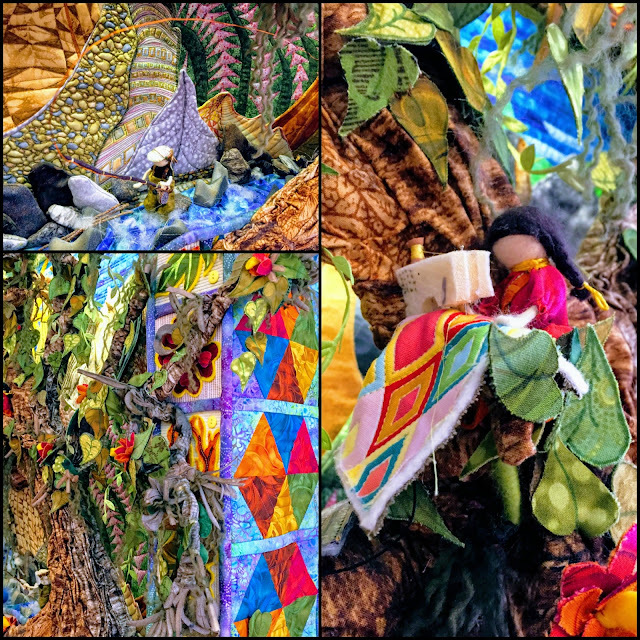 As you go, be sure to look for the Storybook Fairy Houses of Highfield Hall & Gardens that delights visitors both young and old alike. This bi-annual exhibition of 25 miniature masterpieces features houses inspired by the artists' favorite storybooks – some will be well known, others a delightful surprise. Running through September 4th, fairy maps are available with museum entry. Visitors check the map for Fairy Houses in the Sunken Garden at Highfield Hall. Enchanting shells in the woods. Narnia by Amanda Wastrom; inspired by The Lion, The Witch, and the Wardrobe by C.S. Lewis is just one of 25 fairy houses located in and around Highfield Hall. Located at 56 Highfield Drive in Falmouth, Massachusetts, Highfield Hall and Gardens is open April 15th to October 31st, Mondays - Fridays 10:00 am to 4:00 pm, weekends from 10:00 am to 2:00 pm. Admission is $5, members and children under 12 are admitted free. Beebe Woods and the grounds are accessible year-round from dusk to dawn. For more information on this wonderful venue, visit their website, 'like' them on their Facebook page or follow them on Twitter! Many thanks to both Annie Dean and Janet Passani, Highfield Hall's Director of Marketing, for our tour of the exhibitions and grounds at a true gem in Falmouth - I'll never think of the Cape as just seafood, beaches, and lighthouses anymore!